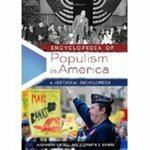 "Encyclopedia of Populism in America: A Historical Encyclopedia" by Alexandra Kindell, Elizabeth S. Demers et al. Lydia Willsky-Ciollo is a contributing author, "Mary Baker Eddy" - pages 197-199, "Burned-Over District" - pages 94-96, and "William Lloyd Garrison" -pages 264-267." Book description: This comprehensive two-volume encyclopedia documents how Populism, which grew out of post-Civil War agrarian discontent, was the apex of populist impulses in American culture from colonial times to the present. The Populist Movement was founded in the late 1800s when farmers and other agrarian workers formed cooperative societies to fight exploitation by big banks and corporations. Today, populism encompasses both right-wing and left-wing movements, organizations, and icons. This valuable encyclopedia examines how ordinary people have voiced their opposition to the prevailing political, economic, and social constructs of the past as well how the elite or leaders at the time have reacted to that opposition. The entries spotlight the people, events, organizations, and ideas that created this first major challenge to the two-party system in the United States. Additionally, attention is paid to important historical actors who are not traditionally considered "Populist" but were instrumental in paving the way for the movement—or vigorously resisted Populism's influence on American culture. This encyclopedia also shows that Populism as a specific movement, and populism as an idea, have served alternately to further equal rights in America—and to limit them. Kindell, Alexandra; Demers, Elizabeth S.; and Willsky-Ciollo, Lydia, "Encyclopedia of Populism in America: A Historical Encyclopedia" (2014). Religious Studies Faculty Book Gallery. 73.